South African artisans painted this candle that arrives in an informative gift box. Each candle is 4 inches tall by 2 inches in diameter. NOBUNTO is a South African Fair Trade company that creates high quality hand-painted candles, ceramics and handcrafted greeting cards with the utmost attention to detail using mainly African inspired designs. Their mission is, in a region with high unemployment, to alleviate poverty, not only through development of industry but to be socially, ethically, and sustainably responsible. 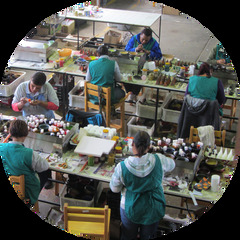 Based in the small village Napier, about 180 km east of Cape Town, NOBUNTO has provided employment to mostly woman of the disadvantaged community and guarantees an income for over 18 families. The unemployment rate in the area is in the region of 50%. The word NOBUNTO comes from the Sotho language, meaning "For the people". We are a Chattanooga gift shop and marketplace for sustainable shopping. Here you will find Eco-friendly gifts, ethically sourced jewelry, sustainable fashions, organic essential oils, souvenirs & unique home decor. We've partnered with small-scale artisans and local artists to offer unique products using materials and techniques exclusively through fair trade. It is our mission and commitment to lift artisans, and to help them grow sustainable businesses. With every purchase, you are inspiring a positive change to improve the life of every artist by supporting their craft. Shop Good World Goods, your Chattanooga, TN local art and fair trade gift shop, because you care about what you buy and what you give.